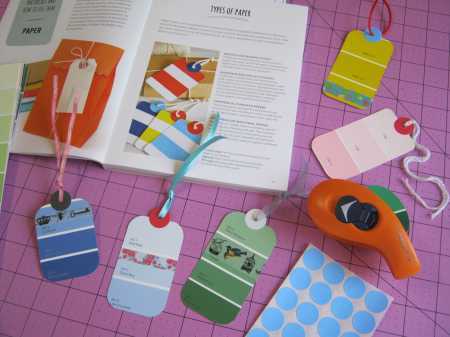 Tags are a fun thing to make and the book Packaging Your Crafts is filled with tons of great tag and wrapping ideas for your crafts. I was inspired by this page that had striped recycled tags. I used recycled paint samples as my base. Then I took round stickers, the kind you use for pricing stuff at yard sales or color coding things (I had these left over from my set decorating days. We would put them on all the objects we put on set so that when it came time to return all the rentals we could easily tell where they went. I placed one sticker on the front and one aligned with it on the back. Then I simply punched a hole in the center and ran a scrap of ribbon or twine through it. A few I also embellished with a bit of Washi tape. 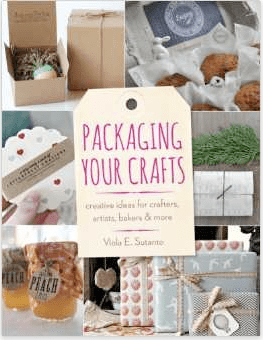 If you are looking for inspiring and creative packaging ideas I bet you will like Packaging Your Crafts as much as I did.